This post has been read 2685 times! 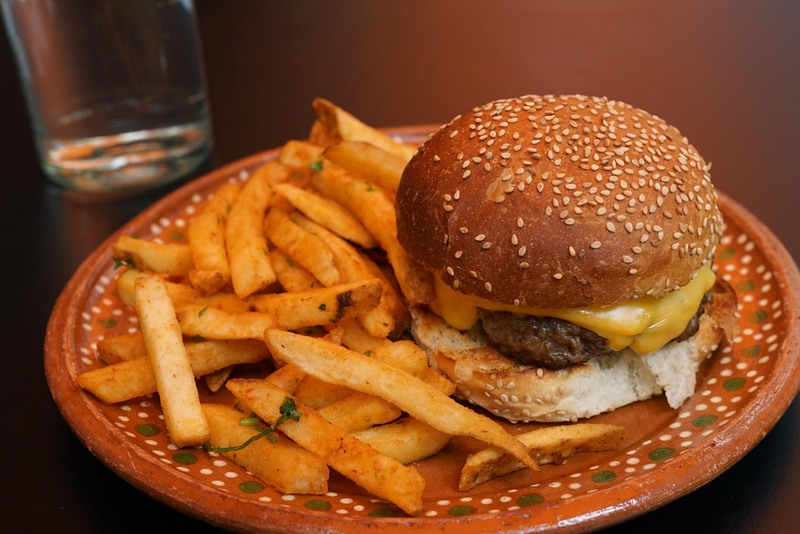 Without consulting me first, El Vez expanded their brunch menu and added a cheeseburger with fries for only $13. Chefs LaForce and Tracey created the kind of hamburger that is perfectly to my liking, and in my opinion, is the best cheeseburger Downtown. For starters, the bun is a sesame-seed-packed moist piece of perfection. The bun is so crucial to the hamburger. Then, the beef patty is not too round (fancy New York chefs seem to think that a hamburger should be a meatball). It is also not too spicy or greasy. It looked to be about a 90%-lean high-quality-beef patty. Chef Tracey made my burger and delivered it in person. His toppings today were cheese, tomatoes, and what I believe to be jalapeno pepper. The pepper gave it a nice twist. The French fries were also to my liking, not being the thin string cuts, and also not too large like potato wedges. Tracey added some spices to them, and I think there was a touch of basil or garlic. Of note, my kind words above were not purchased. I have no financial bias in this matter. El Vez delivers throughout BPC now. This entry was posted in American, Battery Park City and BPCA, Food Essays, Hamburgers, fries, Reviews, Tex-Mex. Bookmark the permalink.